In all the hoopla about the outrage of a duck hunting video posted on YouTube and the following arrest of the poachers last week I didn’t have much time to write about an event that is very dear to me. 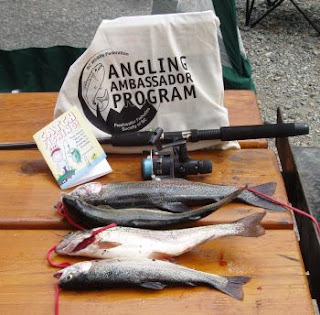 To educate the general public on the benefits of angling and to provide instruction on fishing regulations interpretation pertaining to angling and conservation. BCWF members will offer fishing advice ( where to and how to ) at various lakes in the Thompson/Nicola Region. The program will encourage the general public to participate in angling, providing the opportunity to have fun for individuals and families. Provide information on BC Wildlife Federation, Report All Poachers and Polluters (RAPP), Freshwater Fisheries Society of BC (FFSBC), Habitat Conservation Trust Foundation (HCTF) and Ministry of Environment(MoE). The Thompson River watershed and the Nicola River watershed are designated sites including various lakes in the region and surrounding area. On Wednesday August 5th we had our first ambassadorial duties. 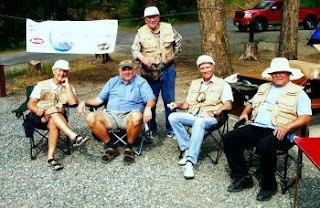 Our group (Photo from left to right, Jack Madryga, Cyril George, Bill Otway, Othmar Vohringer and Paul Komonoski) headed to the Kentucky Lake located in the stunningly beautiful Kentucky Alleyne Provicial Park. 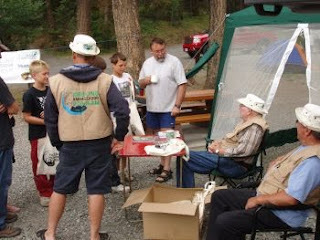 After we set up the information booth and unloaded all the boxed full of fishing literature, tackle and fishing rods to be given away to young anglers we just had time for a refreshing cup of coffee before the action started. In no time the booth was busy with anglers of all ages asking questions or just stopping by for a friendly chit-chat. The children were exited and thankful for the presents and all the advice we dispensed on how to catch fish. It didn’t take long before the first child came back to our booth and proudly showed off the trout she caught with the rod and tackle she received from the Angling Ambassador Program team. Part of our “job”, and for me the most rewarding one, was to walk around the lake visiting with the anglers and helping them with any questions they may have. For me the biggest joy of the day was a young girl that tried for the better part of two hours to catch a fish. She kept asking her father what to do but he has never fished before either. After setting her fishing rod properly up and choosing the lure of the day and then showing her how to cast she caught a handsome rainbow trout of a respectable size. To see the girl’s face light up with a bright smile when she reeled the fish in combined with the joyous “Daddy I got one, Daddy look here I caught a fish.” was all the reward I needed. As I said at the beginning of this article, this was our first Angling Ambassador Program but it certainly was not our last one. As anglers and hunters we do not need a title and a uniform to become ambassadors of our great outdoor heritage. Every time a hunter or angler helps somebody else less knowledgeable with advice and some friendly encouragement he or she is an ambassador of our sport and contributes to the continuation of our treasured outdoor heritage. Learn to catch more fish. Othmar Vohringer offers fishing courses for the beginning to advances angler. thanks for these posts. It's great to see some new stuff on fishing nowadays. Every blog I go to seems like it's stale..except yours! THanks! wow thanks for linking that duck hunting story.. those hunters are not hunters, they are PUNKS. I can't believe the ignorance of the youth, god help us all. I swear there is nothing better than seeing the smile on their faces when they hook into a fish and a bigger smile after they land it. These are memories neither one of you will ever forget and the bond between you two just got stronger. Now if I can get my little 4 year old girl to not scream and run away after she sees it and will not look terrified when she poses for a picture with her catch.